The Maryland Department of Transportation State Highway Administration (MDOT SHA), in cooperation with the Maryland Historical Trust Press and the Federal Highway Administration, published "Historic Bridges of Maryland" by Dixie Legler and Carol Highsmith. Dixie’s lively prose and Carol’s brilliant photographs highlight 75 of Maryland’s historic bridges. 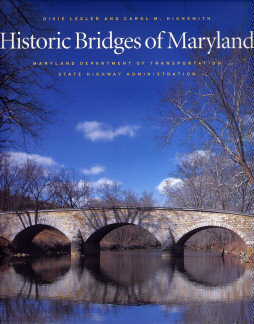 Historic Bridges of Maryland can be ordered from The Maryland Historical Trust. To view bridges featured in Historic Bridges of Maryland click here. Many featured bridges played key roles in Maryland’s history and these treasures are found throughout the State’s landscape. Consider Washington County’s Roxbury Mill Bridge, a powerful limestone structure over Antietam Creek that dates back to 1824 and carried eager early American settlers westward. Today, the steel beams of the William Preston Lane Jr. Memorial Bay Bridge arching over the Chesapeake Bay continues to unite the State’s western and eastern shores. Witness first-hand the diverse beauty of the Free State from the perspective of these creations that stand mightily in defiance of time, as well as those that exemplify modern engineering concepts.